We got multi-cultural for ya here. Have you met the Mayor of Central Park, Alan Geiger? Alan is a true New Yawka, yet loves the South Bay here in California, splitting his time between the two. He also is an aficionado of many things Japanese, including his wife, yet spends vacation days cycling from Hotel Dory in Riccione, Italy. Multi-cultural, I told ya. I met Alan many years ago after he moved to the South Bay part-time and started showing up for the Doctor’s Ride at Malaga Cove Plaza in PV. 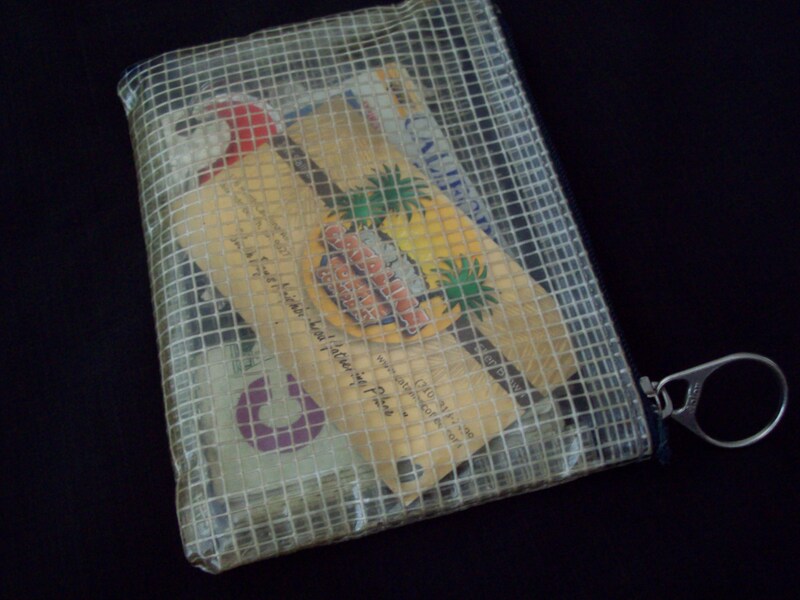 Soon after that he handed me a little zippered plastic pouch with fiber reinforcing strips embedded in it. “This is perfect for replacing the chintzy sandwich bag in my jersey pocket,” I thought. And it was. My ID, cash, keys, credit, pen, ride leader waiver form, and Catalina Coffee frequent buyer card all fit in it and ride with me. I have been carrying that zippered pouch ever since then on every bike ride I have done – various places in California, in Michigan, in Baja, in NYC Central Park (with Alan), in the San Juan Islands and in Hawaii. It would be going with me to the French Alps in September if my dog had not eaten the France trip. As the wankmeister said, much more humorously than I ever could, it’s “the best bike gadgmo I ever didn’t buy.” (20140515 – Well, that link no longer works. 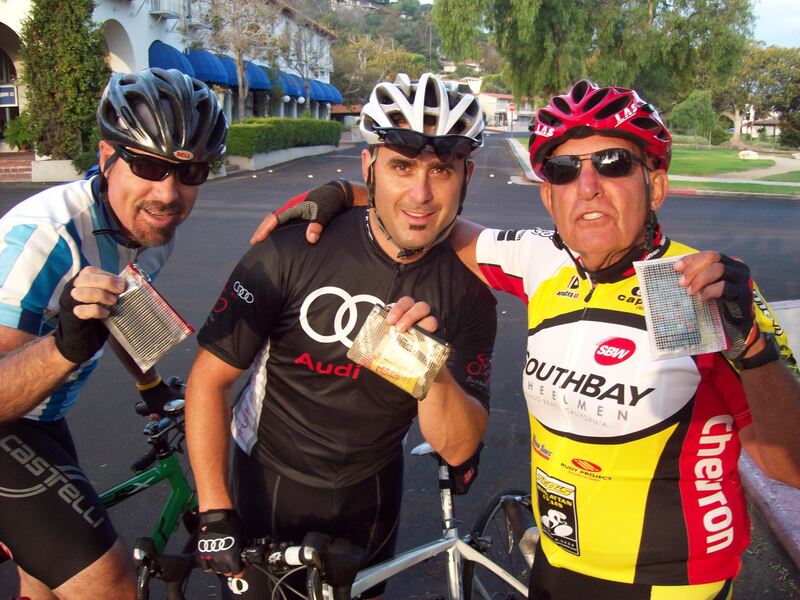 The Wankmeister apparently removed from his blog material that he put into his book – Cycling in the South Bay. Damn, he IS a wankmeister.) With a nod to wanky, I call it the Gadgmo Nihon Recursive Pocket, a pocket IN your pocket. You have my permission to acronymize it as GNRP. The reason that I’ve been doing this for over ten years was not for celebrity or economic gain, but to make people smile. What other way could I possibly do this? I’m unlikely to discover cures for nasty diseases, save a life, become a terrific guitarist or singer. I can give out just so many homegrown oranges, Mikan, tomatoes, etc to neighbors and friends. Being very lazy, what easier way could I possibly have found to brighten someone’s day than giving out these things? Riders going home just after having gotten one, despite maybe being dropped by a group of Freds, will most likely be happier than when they left home. Our older daughter, who claims to be doing pediatric cardiology, but maybe doing little more than cycling, while dodging “those pesky little patients”, has taken over from me in NY, and after stealing all my cycling buddies in Central Park, is now giving out pouches, but, as a stingy brat, the only recipients are likely to be good looking Cat 2’s. The saddest memory this has revived is of Earle in NY, who died of cancer last year, a CRCA racing brother and the most beloved guy in Central Park, who kept me laughing with jokes, mostly racial, during countless repeats up Harlem Hill. Somehow I had missed him when giving them out, but he had seen the pouches being drawn by fellow riders at coffee stops around the city. Sliding up next to me one morning he asked me to “show the brother some love”. Even then he knew that I loved him, but it took his death for me to know how much. Few know this, but in my dotage, distribution has gone beyond the cycling community (those patient enough to ride slowly and talk to me). My neighbors all have them, as do the doormen and maintenance guys in our building in NY, a sample lady at Costco ( a matched set of all sizes on September 23, her birthday). Scott, Gary and Alan display their GNRPs. This entry was posted in cycling, oddities, socializing. Bookmark the permalink. I’ll tell you what’s nice – that Hotel Dory. Have you checked their website? That might be the next overseas place I take my GNRP. You know Alan, I met you several months ago and have been riding occasionally with you. It was only today that you gave me a GNRP, so now I know that you love me, and I am in your circle of friends. Good to be there! I immediately put it to use and for the first time in a long time, the lady at the Starbucks didn’t have to unfold a wet five dollar bills. It has already made me more popular and that disgusted look on the cashiers face has cleared up! Thanks buddy…. How did I ever neglect Les for so long, and can he ever forgive me? Can I blame it on senility? At least now he knows that I love him (well, not in THAT way).